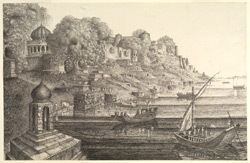 Pencil and ink drawing of Maheshwar fort with the river and bathing ghats in the foreground by Sir James Abbott (1807-1896) in 1843. On the original mount is inscribed: 'Castle of Mhaiswa looking up the Narbudda. From Nature by Genl. James Abbott 1843'. Maheshwar is situated in Madhya Pradesh on the north bank of the River Narmada. It is a beautiful temple town which has been associated with Mahishmati, the ancient capital of King Kartivirarjun, a spectacular temple city mentioned in the Ramayana and Mahabharata epics. The city was significantly developed by the legendary Holkar queen Rani Ahilyabai of Indore (died 1795) who built the fort complex here on a hill beside the river, as well as several picturesque temples and ghats which line the river banks.